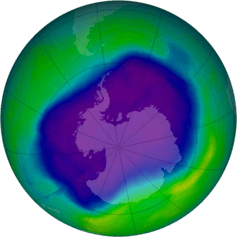 What the Montreal Protocol has done for the ozone hole threat other international accords could do for climate change – if we all agree, says Leeds University academics Anja Schmidt and Ryan Neely. The hole in the ozone layer was first discovered in 1985 by scientists from the British Antarctic Survey, who described how ozone levels above the Antarctic were steadily dropping compared to the previous decade. This was quickly recognised as a severe environmental problem – and the culprit was identified as the unchecked use of chlorofluorocarbons, or CFCs. The chlorine atom is the component of CFCs that is responsible for ozone destruction. Very little chlorine exists naturally in the upper atmosphere as it generally emerges near Earth’s surface – for example from salt (sodium chloride, or NaCl) in sea spray – in water-soluble forms that are “washed out” of the atmosphere by snow and rain. CFCs on the other hand are not water soluble, so are extremely efficient at carrying chlorine high into the stratosphere at the level of the ozone layer. Once in the stratosphere, ultraviolet radiation breaks free the chlorine atom to destroy ozone and react with other substances. The reason there is an ozone hole in the Antarctic is that it is the coldest place on Earth – it is so cold that clouds form in the Antarctic stratosphere. Those clouds provide surfaces on which the man-made chlorine from the CFC may go on to destroy ozone much more efficiently. Together with sunlight, this special chemistry is what makes springtime (late August to October) ozone depletion worse in the Antarctic. Our study, led by Professor Susan Solomon of the Massachusetts Institute of Technology alongside colleagues from the National Centre for Atmospheric Research in Boulder, Colorado, shows that the rapid worldwide agreement to sign and implement the Montreal Protocol has paid off. Signed by all the countries in the world, it was the first universally ratified treaty in United Nations history. We show that the average size of the ozone hole above Antarctica each September has shrunk from about 20m square kilometres to 16m square kilometres since 2000. There are other metrics that indicate the ozone layer is on the mend – such as observations that the ozone hole is opening about 10 days later than in 2000. But even while we are on the way to resolving one environmental issue, the next is already upon us: man-made climate change. These observations became even more meaningful through our study’s computer model simulations which meant we were able to attribute more than half of the hole’s shrinking to the reduction in CFCs. While a trend showing the hole is shrinking is evident, the size has varied from year to year. This is in part due to the effects of volcanic eruptions. For example, the fourth-largest ozone hole occurred in October 2015 following the eruption of Calbuco volcano in Chile. The mechanism by which volcanic eruptions affect ozone levels is well-known: eruptions emit sulphur dioxide, which is converted into tiny airborne particles (aerosols) that enhance chemical conditions for chlorine to destroy ozone. But even while we are on the way to resolving one environmental issue, the next is already upon us: man-made climate change. While the ozone hole is a relatively contained problem and involved only a single CFC-producing industry, the factors contributing to climate change involve many huge, established worldwide industries worth many trillions of dollars. The task ahead of us is great, nonetheless, tackling the ozone hole problem shows what can be achieved if we collectively set our minds to solving a problem. Anja Schmidt is academic research fellow in volcanic impacts and hazards, University of Leeds and Ryan Neely is lecturer in observational atmospheric science, University of Leeds. This article was originally published on The Conversation.